Excellent 10,000 Birds posts have been written about Pico Bonito and Honduras by Corey and Carlos, so I’m going to focus on some of my most memorable experiences. Like the Great Tinamou, Tinamus major. 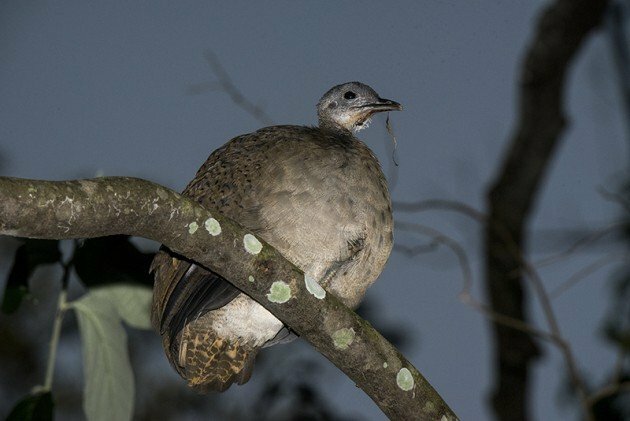 If you’ve birded the Neoptropics, then you’re familiar with the haunting sound of Great Tinamou, and may have even seen the bird, as I did in Costa Rica, walking through thick rain forest foliage. It’s there in the shadows and then it’s gone. Well, at Pico Bonito we had our own personal Great Tinamou. It roosted for two nights, maybe more, outside cabin 7, occupied by my friends John and Mike. John first spotted the tinamou the third night of our trip as he was relaxing on the porch hammock. According to Mike, who witnessed its entrance the next night, it would toddle around the brush in front of the cabin for a few minutes, brush its teeth–ok, I made that up but the toddling description does remind me of how I get ready for bed, then walk over to a tree three feet from the porch and perform a leap with wings onto a branch about 8 feet high. My cabin was located in a separate area from most of my group, so I didn’t know about the Tinamou till I arrived at the bar for our pre-dinner drink and checklist. “There’s a Tinamou outside Cabin 7,” they told me, “It’s on a horizontal branch. Go, quick, before it gets dark.” “What?” I said in confusion, “A real Tinamou?” I was wondering if they had started drinking early. Well, by the time I went back to my cabin for my camera and found Cabin 7, dusk had just about passed. And, it turns out (no surprise), that there were many horizontal branches near Cabin 7. Luckily, Carole had given me an additional landmark, a large dead palm leaf, and I soon realized that the round thing on the horizontal branch in front of the leaf was indeed a living thing. Walking quietly to the back, I even saw a bill. There were many wonders in and around the Lodge at Pico Bonito. Corey has already written about their famed Great Potoo, Nyctibius grandis. This was not a life bird for me, but I gotta say, this is one big Great Potoo! Luckily, its current roost was away from the cabins and I only heard it once at night (word of mouth is that the Potoo has on occasion roosted by cabin 21, and I was in cabin 20). 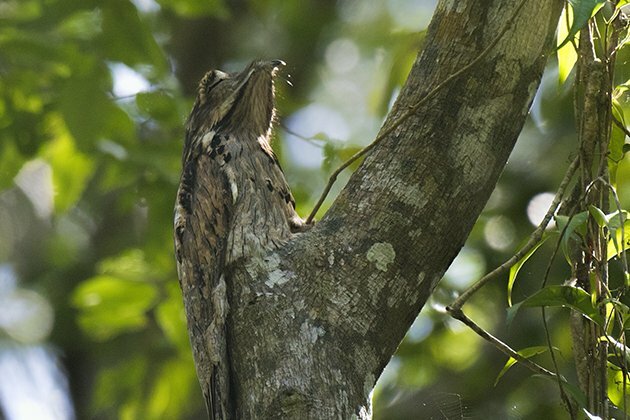 How to describe the sound of a Great Potoo? Well, let’s just say that if you didn’t know it was a bird, you’d be dialing 911 and reporting a crazy person retching on top of your cabin. We saw a smaller member of the potoo family, Northern Potoo, Nyctibius jamaicensis, at Cuero y Salado Wildlife Refuge, boating and birding the Salado River. When Esdras asked us to find the bird without his help, I flashed back to my first potoo experience on the Napo River, Ecuador, where I was literally face-to-face with a Common Potoo and still saw a stick. 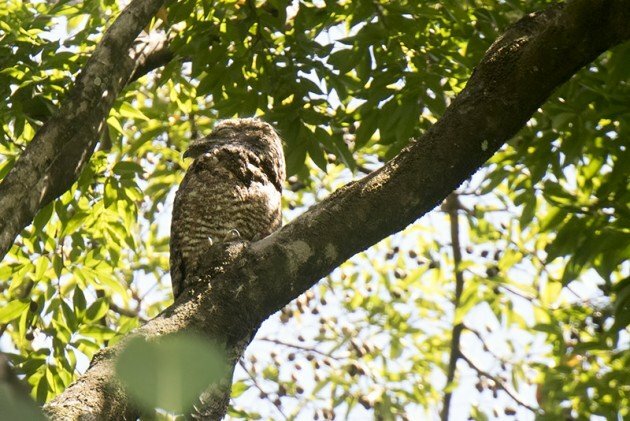 But, I was birding with experienced neotropical birders, and Linda soon spotted the Nothern Potoo disguised as part of a nearby tree. Later on, we saw a second one that was actually moving! A life bird was most everybody in the group. Our group got to see another species that is a master of camouflage on our trip for the Honduran Emerald. 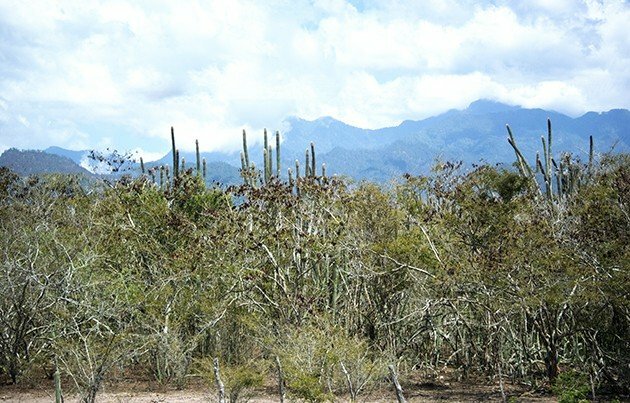 This was a long day trip (leaving time 4:30am…or 4:00am…I do remember setting my alarm for 3:30am, the rest is a blur) and one I thoroughly enjoyed as we travelled from a habitat of rain forest and dense foliage to a habitat of scrub desert and cacti, called “dry forest”. An amazing ecological transformation. Double-striped Thick-knee, Burhinus bistriatus! The nocturnal, grassland shorebird with the great name! And, a Life bird for all visiting birders. 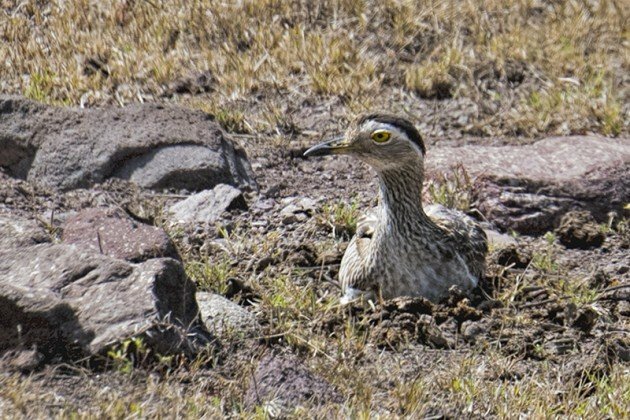 Before long, a second Thick-knee was located, a female (we thought, more on this later) sitting on a nest. This is what this bird looked like from the road, with some photographic cropping and contrast. 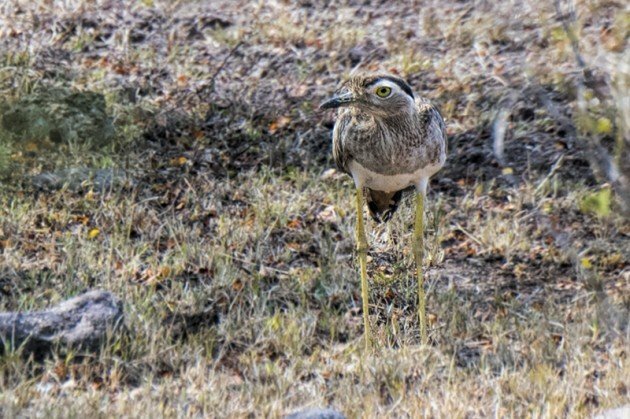 I had seen Thick-Knees in South Africa, but I was very excited to see this species, which is the only member of its family found in Central America. Though common, it is not easily seen because of its cryptic coloring and the fact that it stands still for most of the day. Double-striped Thick-Knee nests are shallow depressions in the ground, with a typical clutch of two eggs. The Cornell Lab of O NeotropicalBirds entry says that the “non-incubating parent” is usually nearby, which I think means that they don’t know whether the incubating parent is the male or female or both. 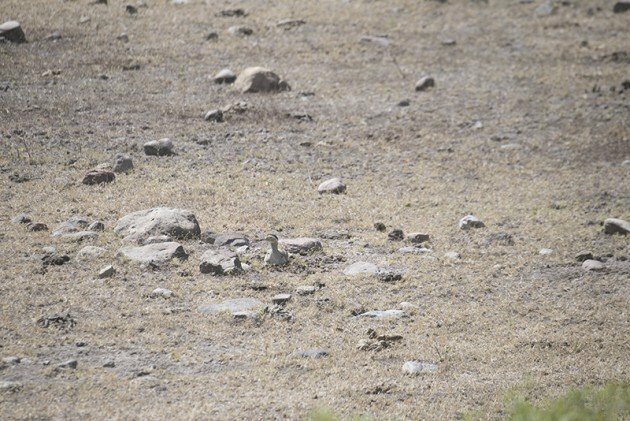 We just assumed that the Thick-Knee on the nest was the mother. We may have been wrong. Looking over this post so far, I see a theme. 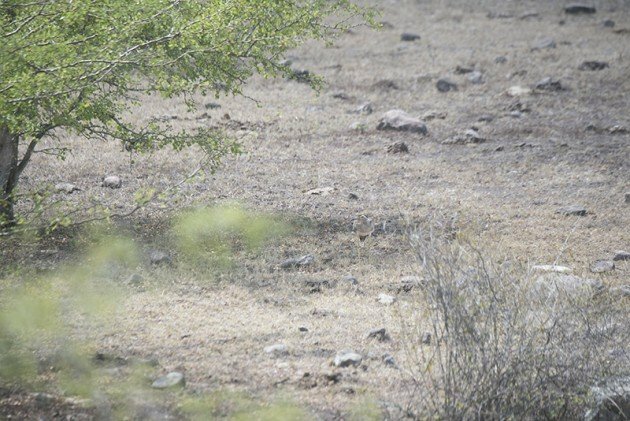 All of these experiences have been with brown/black/gray birds, birds known for their camouflage. Which is why seeing them was such a great experience. And, I didn’t even touch on the owls! That will have to be for another post. But, I don’t want to finish this post off without a bit of color. 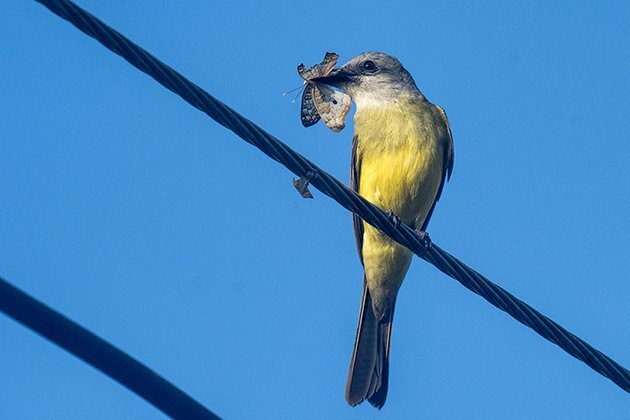 I started with Tropical Kingbird, a common bird of yellow and white and gray. 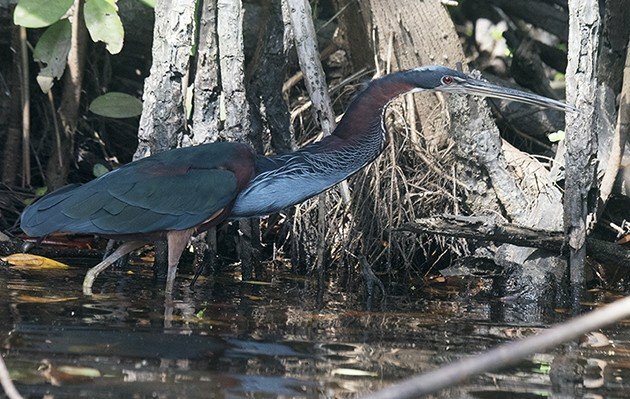 I’m ending with Agami Heron, Agamia agami, an uncommon bird of endless hues of blues and greens and reddish-browns with a touch of white. The boatmen steering our two skiffs at the Cuero y Salado Wildlife Refuge knew the general area in which to find the bird, but it took a while before they spotted it. At first, for a long time, we could only see patches, and I despaired of a decent photo. But, happy things come to those who wait, and the heron eventually walked slowly out of the dense shadowed foliage and into the open. A life bird for most, and incredible experience for all. I hope, despite BLI predictions, they find a safe haven in this area of Honduras for decades to come. * Condor, May 1963, vol. 65, p. 224. 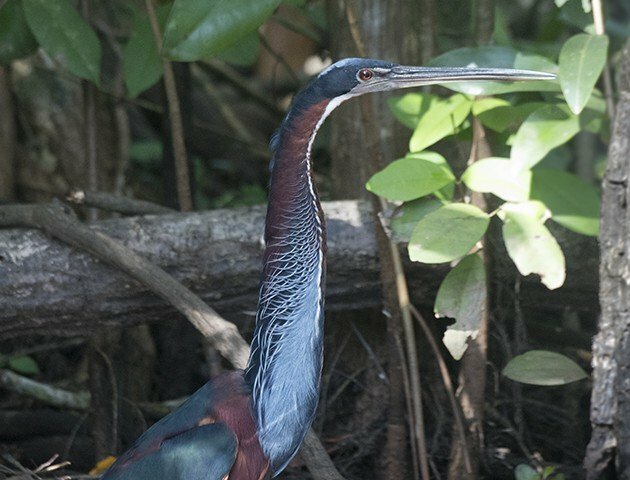 What unusual and interesting birds! Sounds like a fabulous trip!